Pressure cleaner, water blasting and sealing a concrete slab. 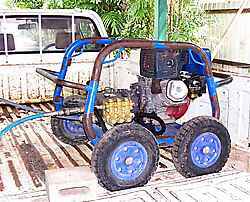 Pressure cleaner - A 3000 psi water blaster - cleaner, petrol engine. 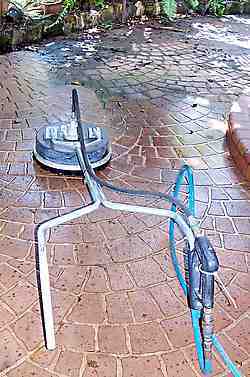 Pressure cleaner - An attachment for a water blaster that allows controlled even cleaning of a wide area. It has a rotary bar with two heads. Applying the sealer with an old lambswool paint roller. 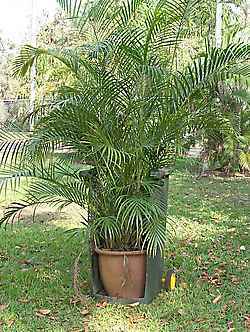 Pressure cleaner - Modified wheely bin for moving heavy plat pots. 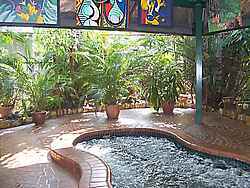 Recently I hired a pressure cleaner, or water blaster to clean up the concrete in my pergola / spa area, and around the concrete verandah to our house. The stamped concrete was done about ten years ago and was sealed when it was new. Unfortunately the owner (that's me) has been a bit slack and not bothered re-sealing it, ever. Concrete like this in an area that gets watered every day, should be re-sealed say about every two or three years to keep the mildew at bay, and the surface looking good and easy to clean. I actually own a small 2000 psi (pounds per square inch) pressure cleaner that is good for small jobs. I bought it when I was screen printing, to pressure clean the screens, and I have even used it to clean my roof down, but for this job I hired a larger one. The larger 3000 psi machine that I hired from our local Coates Hire branch, more than paid for it's hire, in ease of use and speed. You may think that the jump from 2000 psi to 3000 psi is small and why didn't I save a bit of cash, seeing as I am retired now and my time is not all that important. The reason I forked out around $140 a day for a larger petrol engine pressure cleaner is this. The extra raw power is definitely important. It will shift more stubborn dirt. Not only is the nozzle pressure greater, but the pressure pump delivers a lot more water at that increased pressure. 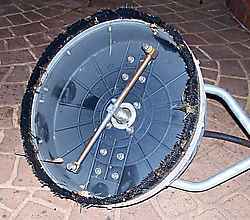 Because of this, the rotary "whirl-away" attachment comes into the picture. I didn't measure it, but the whirl-away will clean about a 450 (18") wide section at a time. This with very little effort on my part. I just slowly walked up and down with it. Another huge benefit of this pressure cleaner attachment it that it cleans without leaving the zebra type stripes that the wand or lance does. When using the standard wand with a conventional nozzle, (which is ideal for around the edges and columns etc.) the tool has to be gripped very firmly with both hands to resist the thrust of the nozzle. There is no rest when using it, unlike the rotary attachment which is very easy to use. Once I had the stamped concrete area nicely cleaned I left it a day or so to dry out before sealing it. I used what I think is a top quality acrylic sealer (ask me in a few years time). Purchased from a specialist concrete additives supply company. $160 for a 20 Lt. drum. I gave it two coats on separate days. To apply it I used a 100mm brush for the edges, and a 20mm lambs wool roller for the rest. The company recommends using a percentage of thinner in the first coat, to help the sealer to penetrate the concrete surface, but I used it straight out out of the can. Again the recommendation is to use a special thinner / cleaner for wash up. Even though the product is acrylic based it has a strong solvent smell with it, and I wouldn't like to use it indoors. I threw the two roller covers away (they were on their last legs as they have done a lot of other work) rather than do a messy solvent based clean up, but I had a vague memory that methylated spirits can be used for shifting partly dried acrylic paint, so I gave it a try on my paint brush and it worked a treat. I had to move some heavy plant pots out of the way when I was doing the job, and then move them back afterwards. For this I borrowed a trolley from my mate. The sort you move fridges around with. It had a far to small platform. The pots just would not sit properly. What a bummer, I considered bolting a couple of forks onto the bottom of the trolley, but I thought that the weight of the pots might break the thing. I cast about and here's what I came up with. A five minute alteration to an old wheely bin that I had lying about. It worked a treat. Now before you start, I bought the old bin at our recycling shop at the dump. Honest! Trust me, I wouldn't vandalise council property, no way! Not even to save the risk of a hernia. Leave pressure cleaner and back to home page.